Retro-Bit, leader in retro consoles, controllers and video game hardware, announced today Retro-Bit Europe, a new subsidiary bringing their state-of-the-art console hardware to European gamers. First to be released is the Super Retro Trio Plus, a compact console capable of playing original NES, SNES and MegaDrive cartridges from virtually any region in glorious HD. 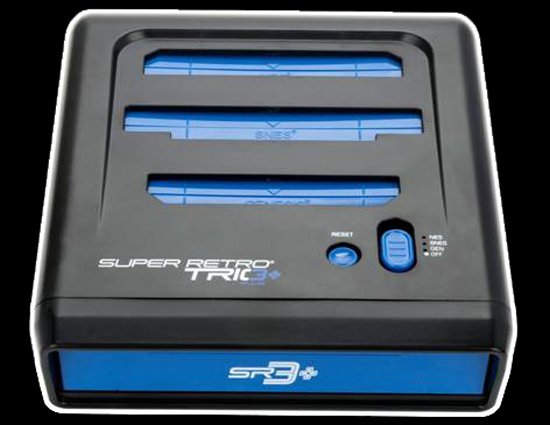 Available for pre-order today with shipping scheduled for December this year the Super Retro Trio Plus features a simple region switch, bringing compatibility with genuine cartridges from NTSC/PF/NJ and, for the first time, PAL regions. This will allow players to enjoy their collection of PAL cartridges all over again, but this time via HDMI on modern TV’s and in razer-sharp HD resolution. Distributed throughout Europe by Game Outlet Europe (GOE Distribution), and in the UK via PQube, the Super Retro Trio Plus comes complete with two high-quality controllers, inspired by classic consoles and featuring no fewer than six controller ports, fully compatible with original 1st party and 3rd party controllers for all three console formats. The Super Retro Trio Plus is available for pre-order today at Amazon.co.uk and from other leading retailers upon release this December 2017.